I’m on my way to visit a friend – she’s got a double fractured leg, has been shut away in her house for weeks and gone through numerous casts, boots and hospital appointments. As I walk through the door she glows. That sort of ‘life is good, I’m happy, healthy and in-the-flow’ glow. I’ve no idea what she means. Admittedly, I have never seen my lovely friend without make-up before (it suddenly hits me how much make-up I wear) but without it, she is even more beautiful. I am clearly seeing something she isn’t (or vice versa). My friend is emotionally strong. Despite her journeys and her challenges, she has emerged the other side and has her life in perspective. She has removed the dramas, worked on herself and found a place of peace. This, I think, was the glow I could see; even if she couldn’t. To me she was gorgeous. I truly think if you look at someone closely you see beyond the surface. 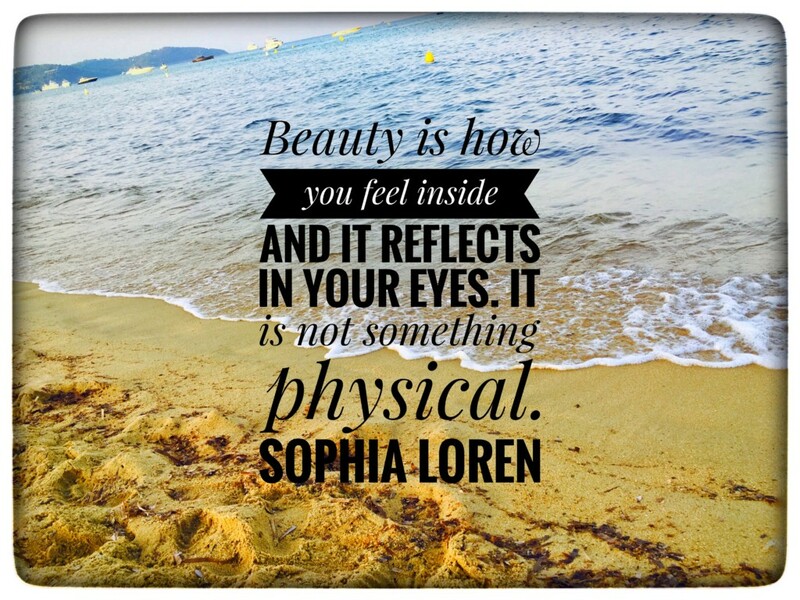 When I was younger, so many people said to me, ‘beauty is on the inside and not the outside’. What a load of tosh, I would think. Tell that to Marilyn Monroe and Sophia Loren fans, not to mention my love of Gregory Peck. But all these years later and I hope a little wiser, I genuinely and wholeheartedly think it’s true. I remember making a film with a wonderful organisation that works with children with facial disfigurement; and I recall so clearly how after such a short space of time with these inspiring teens, I no longer saw the differences, I just saw the beauty of the spirit that sprung from within. For me, I think it is all about looking beyond the surface. With some, like my friend, it literally leaps out at me (even if she can’t see it!). With others, it may be different: an unhappy friend; a grumpy waiter; an angry colleague. But approaching people and looking at who they truly are is, for me, the key to happy relationships. I try to see beyond the frustrations of their day, the anger they may be holding, the unhappiness that shrouds their face, and delve deeper to connect to the person they truly are. Sometimes this is hard – especially in situations of conflict – it can feel nigh on impossible; but I like to attempt to take a step back in these circumstances, breathe, and see beyond. Which brings me back to one of my favourite topics: social connections and how important they are, especially on a deeper level. As I like to remember, studies clearly show that those who feel more connected to others have a lower rate of anxiety and depression and social connectedness leads to emotional and physical well-being. So here I am writing this blog, sitting in a café. The waitress has a frown, and her service is far from exemplary. I try smiling. It’s not working. I’m not keen on a lack of courtesy, so I can feel myself starting to bubble inside. And this is where I am different. Years ago I would have got angry and been grumpy back, joined in with her drama, and left disgruntled. Now I play my little game – can I make her smile? Sure enough, with a little enticement, a few comments about the crazy British weather and the delights of my pain-au-chocolat, we are giggling away, sharing life stories. Her faced has changed, her spirit has shifted and I am chatting to the person she is. Not the grumpy waitress I could have seen her as. So that’s my wish for you this week. If you can, have a play with this game – and see how much happiness you can spread! Hello! I’m Sally, Head of Happyness, as the team calls me. Silly title, I know, but it makes everyone giggle including me, so we’ve stuck with it. I’m the founder of the Happynesshub and I am passionate about our work. I’ve spent years reading about happiness and emotional wellbeing, putting the research into practice, and trying to navigate the ups and downs of life’s rollercoaster ride. My dream is to share the work and the love, for each of of us to fulfil our individual potential, and to ultimately make the world a happier place. Love it . I do the smile game quite a lot , it’s interesting !